We’re doing it with or without you is the threat from the broadcasters. ITV, BBC, Sky and Channel 4 have offered a new formula for the televised leaders’ debates. One debate with the Prime Minister and Leader of Opposition alone; and two debates with the leaders of the Conservatives, Labour, Liberal Democrats, UKIP, the SNP, the Green Party and Plaid Cymru. 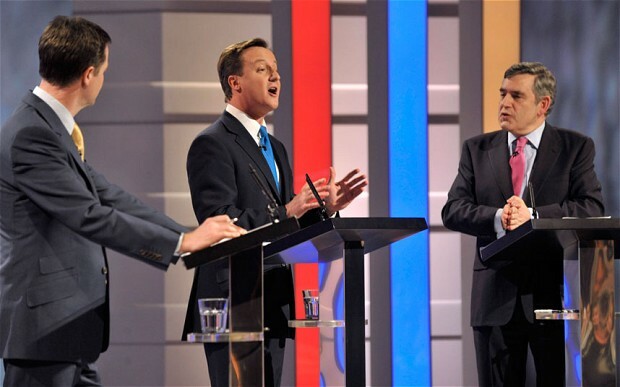 The debates would take place during the General Election campaign – with proposed dates of 2,16 and 30 April. That sounds like a tough couple of programmes to produce. Presumably we’re now into the formal realms of “You have a minute to state your position on the NHS”. But equally, it’s very hard to see how David Cameron can continue to refuse to take part without the “frit” allegation sticking. He wanted the minor parties, he’s got the minor parties. Expect complaints from the DUP, Respect and others though.